Classical antiquity is the period in which Greek and Roman literature (such as Aeschylus, Ovid, and others) flourished. By convention, the period starts with the works of Homer, (8th–7th century BC), and ends with the arrival of Christianity and the decline of the Roman Empire (5th–6th century AD). The classical period of Ancient Greece was from the fall of the Athenian tyranny in 510 BC to the death of Alexander the Great in 323 BC. 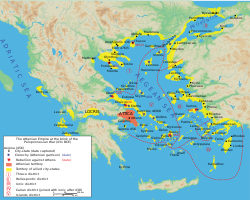 During this period cane the long struggle between Sparta and Athens, and the wars between the Greeks and the Persians. The rise of Macedon in the 4th century overturned all other political systems, at least for a while. It could be said that Rome was already of imperial character. It had no emperor when it conquered Gaul, Illyria, Greece Hispania, and the Roman province of Asia. During Late Antiquity Christianity rose under Constantine I, and finally became the Roman imperial cult in 393. Successive invasions of Germanic tribes meant the end of the Western Empire in the 5th century, but the Eastern Empire persisted throughout the Middle Ages as the Byzantine Empire. ↑ Fargis, Paul (1998). The New York Public Library Desk Reference - 3rd Edition. Macmillan General Reference. p. 262. ISBN 0-02-862169-7. ↑ The precise event which signaled the transition of the Roman Republic into the Roman Empire is a matter of interpretation. Historians have proposed three key events: the appointment of Julius Caesar as perpetual dictator (44 BC); the Battle of Actium (2 September 31 BC); and the Roman Senate's grant of Octavian's extraordinary powers under the first settlement (January 16, 27 BC). This page was last changed on 18 December 2018, at 02:28.